If you follow me on Instagram then you'll know that I am a big, big fan of Makeup Revolution. From the packaging to the product, they have never really let me down and as the brand has expanded over the years, I think the quality has too. If you have ever had a peek inside my handbag (what a great idea for a blog post!) then you will also know that I love being prepared. I always carry a gigantic mirror around with me but lately I want to lighten up the weight of my bag. I was in for a big surprise. 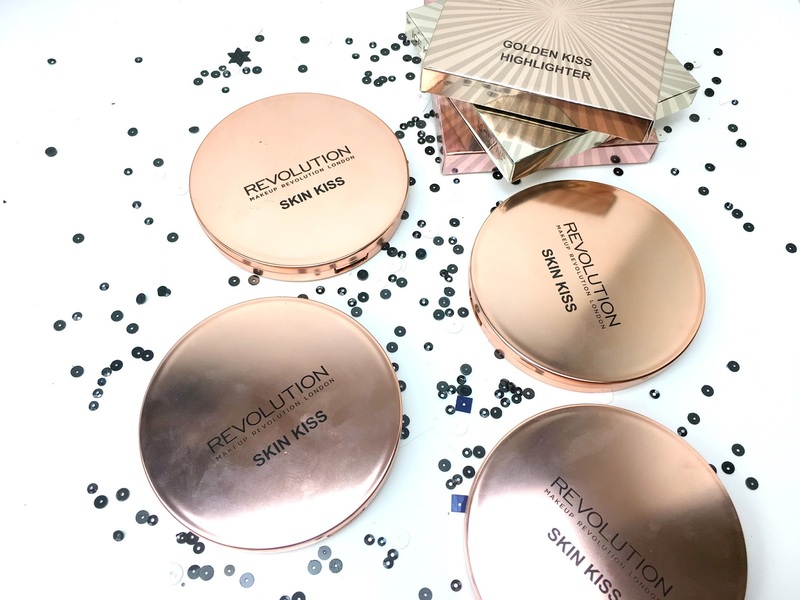 The Makeup Revolution Skin Kiss range* arrived on my doorstep last week. It was totally unexpected and I instantly filmed a first impressions video on my Instagram story. 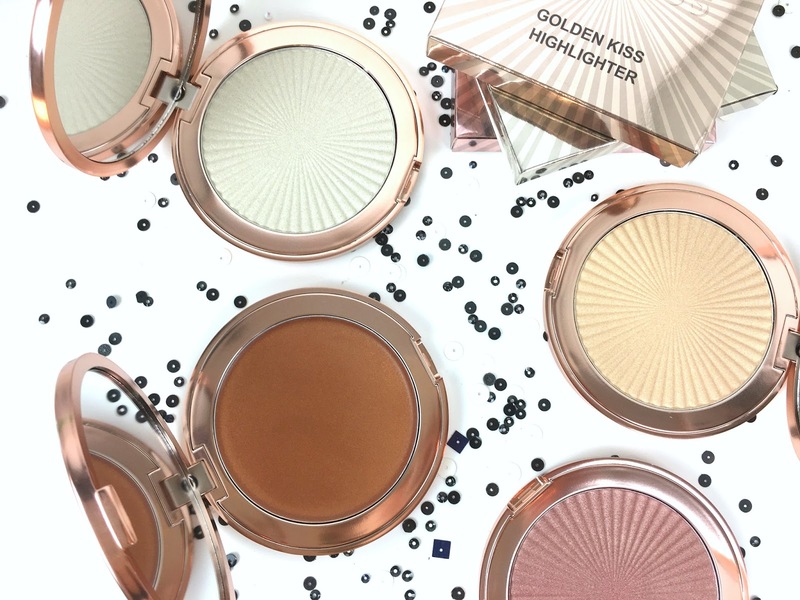 The three highlighters and cream bronzer arrived with a very large mirror attached to the product. I have always found it so irritating when products just have a tiny or medium sized mirror. 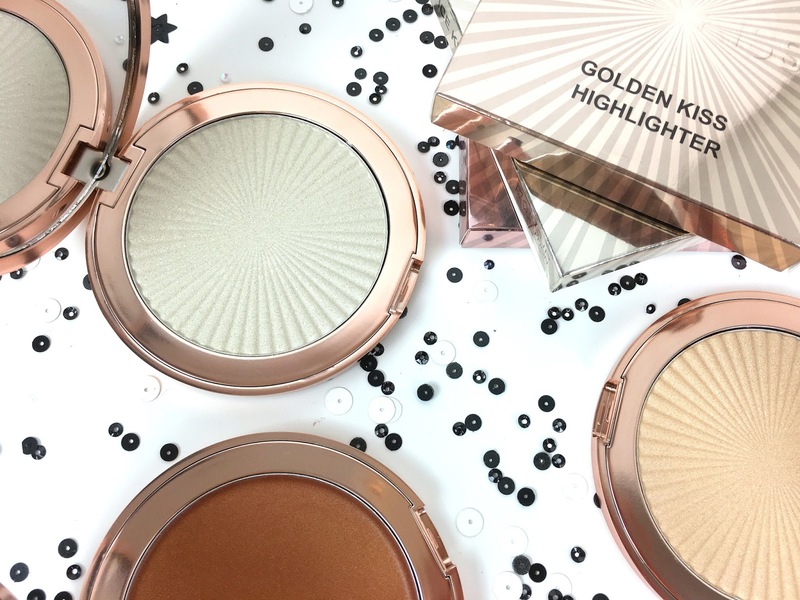 I think this is the first time I've found a highlighter range that isn't afraid of including a big mirror in their compact design. I just love how big the mirror is and this made me pretty excited before I even tried the product itself! The outside of the packaging is very pleasing to the eye, it is quite simple but the metallic finish saves the design for me, time will tell if the metallic finish will become scuffed up easily though but I doubt it. Lets start with the shades, the lightest shade is called Ice Kiss. I normally don't wear white coloured highlighters purely because I want a highlighter that adds a touch of colour and not just shine or simple highlight. With that being said, I loved the pigmentation of Ice Kiss and I found it had so many different uses. I use it on my brow bone, cupids bow and the inner corner of my eyes and I actually use Golden Kiss to highlight my cheek bones. I really love that you can afford to mix the Skin Kiss range together because of the amazing price. 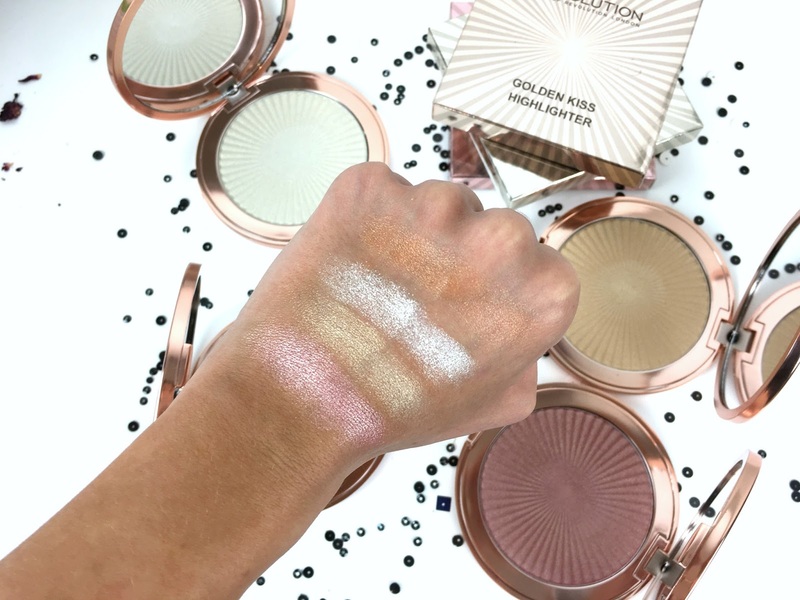 £5.00 is incredible and for the size, pigmentation and shades available - you really are in for a treat with Makeup Revolution. I was really surprised with the Peach Kiss shade, by looking at the product I thought the colour was quite warm and bronzed but when I swatched the shade on my hand, the outcome was really different. The shade is very rosy and pink so this is perfect for tanned and fairer skin tones. Golden Kiss, the second swatch towards the left, is probably the most wearable shade for me, I think it adds a hint of shimmer while also creating a warm, bronzed glow. I like that is adds a hint of colour and it certainly didn't feel cakey or heavy on my skin. This is definitely my favourite highlighter from the three. I would class Bronze Kiss as a totally different type of highlighter because the formula is actually cream and not powder. With any cream product, I like to warm my finger tips up before I use it, Bronze Kiss melted like butter on my finger tips and it really did blend in beautifully on my skin, without creating any unwanted oil. It isn't too shimmery so it is very wearable for the day. If you want a beachy, dewy look that looks really effortless - Bronze Kiss is your winner.